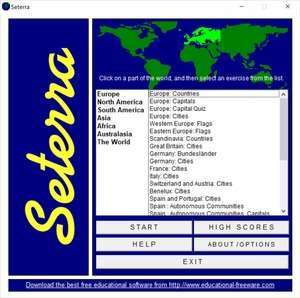 Seterra is a collection of different quizzes and exercises about the geography of all of the continents, countries abroad, etc. The program features 85 different exercises which include naming capital cities, continents, countries, U.S. states, mountain ranges and more. Version 4.02.16 is a freeware program which does not have restrictions and it's free so it doesn't cost anything. For security reasons, you should also check out the Seterra download at LO4D.com which includes virus and malware tests. Additional screenshots of this application download may be available, too.